The hype about mobile responsive design reached a crescendo about a year ago and it is easy to see why. On the surface, the pitch resonates. Why manage multiple sites when you can manage just one and have it resize itself for all channels? When mobile only made up 5-10 percent of a retailer’s traffic, the pitch resonated, but the flaws in this approach have been exposed as mobile commerce has grown far-faster than predicted and has evolved into a unique medium that drives significant revenue for retailers. The notion of “one Web” for all audiences might suffice for content sites such as newspapers or magazines, but, for retailers, the mobile medium now deserves more than a reformatting of a desktop site, shrunk to fit a smaller screen. According to comScore, mobile traffic now makes up 33 percent of all digital traffic for Walmart, 33 percent for Best Buy and 37 percent for Target. These are some serious numbers and for online pure-plays they are even higher and increasing fast. And it is not just traffic. According to eMarketer, 2013 mobile sales are up 68 percent over 2012. Deloitte just reported that almost 70 percent of U.S. smartphone owners intend to shop on their smartphones this holiday season, with smartphone market penetration now more than 60 percent. According to IMRG/Capgemini, mobile commerce made up 23.2 percent of all second-quarter 2013 online sales, yet only 51 percent of smartphone owners reported making a purchase in the last six months. This means we are only seeing the tip of the mobile commerce iceberg. EBay alone will exceed $20 billion in mobile sales this year. As traffic and resultant revenues skyrocket, mobile is quickly evolving into a distinct medium that deserves to be treated as such. No longer does a “smaller copy” derivative version of an ecommerce site make the grade and retailers are starting to notice. Google famously gave responsive a boost, when it “officially recommended” it back in 2012. But one only has to look at how Google makes its billions to see why. A responsive approach makes Google’s job easier, as it can crawl and rank a single entity, versus several. Google’s main point in this same post was to recommend 1) Having a mobile site 2) supporting deep linking and 3) fast pageload speeds. All three of these points, it can be argued, actually lean toward a deep integrated approach, versus responsive. To be clear, having a mobile-specific “mdot” site does not mean search engine optimization (SEO) rankings will become “diluted” or hurt a page rank. In fact, since its “official” recommendation, Google has specifically stated that a responsive approach does not benefit rankings and it is standard practice to add ecommerce page tags that instruct Googlebots regarding the fact that there is alternate content and where it can be found. Another fact: Google itself uses rich mobile-specific sites, versus responsive. The negatives of running all your channels of consumer interaction off a single base of HTML can be most-easily be seen when looking at performance rankings, as the same imagery, graphics and text used for ecommerce are re-rendered for mobile, while load times differ. Also, a resized version of an ecommerce site means only what first exists on the ecommerce site can exist on the mobile site. This is called the “necessarily derivative limitation” and it is key to understand. This same limitation also applies to transcoded sites, by the way. A mobile or tablet site inextricably intertwined with the “upstream” ecommerce site features and functionality can trap retailers into an inability to shape the mobile site specifically for their rapidly expanding mobile customer base to capture maximum ROI and respond to evolving mobile buying trends. A responsive approach also means the changes made to the ecommerce site can cause problems that cascade downstream, as graphics, text and site elements meant for large-screen ecommerce often translate poorly into the smaller mobile site context. These problems are usually discovered when the new online retail content is pushed live and then negatively impacts the mobile site. 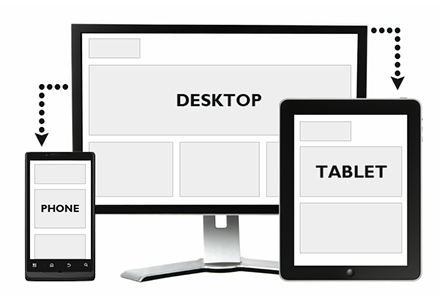 Much has been made recently of a re-positioning of responsive design, sometimes called “server side responsive.” And this is often positioned as a fix to “traditional responsive,” which necessitates a site replatform. But this is really just a rebrand of the same solution, using better detection methodology to try to render different slices and dices of the site, based on the device detected. The essential limitation remains. It cannot exist on mobile if it does not first exist on ecommerce. Building and managing a site built specifically for the mobile medium might take a little more effort, but the payoff is that a retailer can tailor the mobile site experience for maximum effect by adding mobile-specific features and functionality catered to a growing mobile audience. An increasing number of large retailers are investigating ways to unhinge responsive mobile sites from upstream online retail functionality. An alternative to a “derivative” responsive mobile site, and certainly a transcoded site, is one based on a deep integration with an ecommerce infrastructure using API calls. The template for the mobile site is unique and built from “whole cloth,” using best practices specific to the mobile medium. Data such as price, size, SKU, color, availability and imagery flows seamlessly in real-time from current ecommerce operations and is cached locally. Third-party services are integrated and the software that powers the site can be licensed and hosted by the retailer, in-house. Promotional images are designed specifically for the mobile medium and loaded via a control panel dashboard. In this way, current ecommerce operations are leveraged and extended into mobile, while the retailer has the freedom and flexibility to offer mobile-specific features and functionality designed to drive mobile revenue. And they have full in-house control of the entire site. An independent survey of mobile commerce sites conducted by Marlin Mobile showed API-integrated sites load up to 3X faster than transcoded sites and up to 6X faster than responsive sites. Industry-wide conversion rates for all mobile sites in their totality lag behind ecommerce, so reducing friction and ensuring optimal performance is an imperative. A deep integration approach also does not necessarily mean more work for the retailer’s IT team. While this is a common refrain among responsive solution providers, the fact is that once APIs are mapped for a specific ecommerce platform, this “pre-integration” can be applied to all retailers using it, with tweaks and additions made to link up third-party services such as recommendations or reviews. Also, it is increasingly viewed as a positive to have the merchant IT involvement since more retailers want the option of licensing the software and running mobile on their own servers to take technical and creative control of a medium that is responsible for an ever-growing percentage of revenue. MOBILE BUYING behavior is different and the medium is different. As mobile grows rapidly, smart retailers are untethering the mobile experience from their ecommerce site functionality to take maximum advantage of mobile commerce in ways only just starting to be understood. Wilson Kerr is vice president of business development and sales at Unbound Commerce, Boston. Reach him at wilson@unboundcommerce.com. This post was published as an article in Mobile Commerce Daily.